A DELEGATE to my local trades council was reporting last week how families in his part of the London Borough of Brent were being told they should move to another part of the country if they wanted housing. Up the road in the neighbouring Tory-run Borough of Barnet, tenants and residents of the West Hendon neighborhood are confronting a privatised regeneration that will leave many with neither security nor the ability to afford to stay. Across London in Labour-run Newham the E15 Mothers occupied an empty estate to highlight the council's policy, under which they were told to move to the Midlands or further afield. 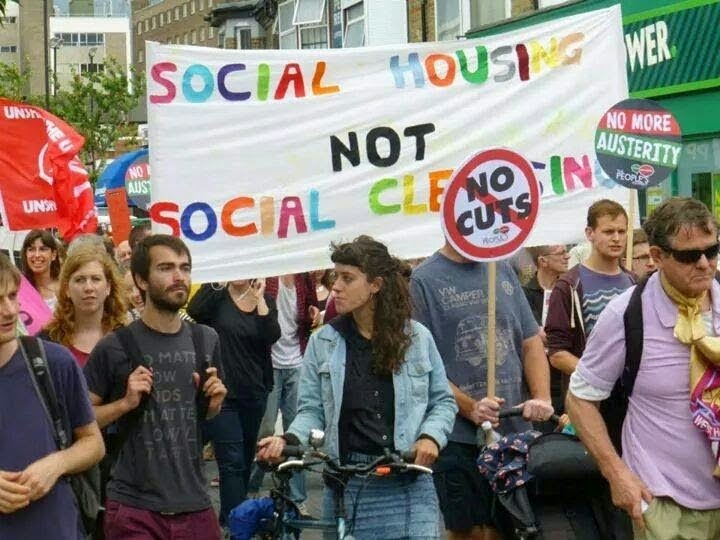 I first heard the expression "social cleansing" used when Tory Westminster council was removing people from the run-down Artillery Mansions block of flats across Victoria Street from City Hall. To be precise, I saw it on an improvised banner protesting what the council was doing, slung from the building's upper-storey windows. I'd just come back from Bosnia so the protesters' allusion to ethnic cleansing needed no explaining. Dame Shirley Porter's policy of clearing streets and council homes of working class people, in the name of "building stable communities" became associated with gerrymandering, and better known as the "Homes for Votes" scandal, leading to the Tesco heiress moving to the Israeli seaside resort of Herzliya, and eventually having to pay a £12.3 million fine. But the broader policy of privatising and selling council housing to Yuppie buyers had been pioneered by Tory Wandsworth council without much problem (except for less affluent people on the housing list who saw entire estates taken out of their reach). Taxi drivers told of fares asking for Battersea destinations across the bridge as "South Chelsea". The battle for urban space that has become too fashionable or convenient for the centre (the Cities of London and Westminster) and so is priced out of reach for working people, has been a recurrent feature of the capital. The problem was intensified under Thatchernomics, when industry, even in parts of London, was left to rust, while the City finance sector and the property market for a time boomed. The pressure on housing, and on transport, with everyone having to come into the centre to work, has continued. Even today, though Mayor Boris Johnson blames homelessness and rough sleeping in the capital on "immigrants", most of the people migrating into London for work are coming from other parts of Britain. London's prosperity does not extend to other parts of the country, nor down to everyone in London. But during the previous period of growth the Duke of Westminster, whose family had donated land to the city for housing working-class people, had to fight a legal battle to prevent Westminster council selling off the estate behind the Tate Gallery, because the council claimed there was no such thing anymore as a "working class". I don't know which new social thinkers the Tories has been reading. Nowadays the battle to resist social cleansing has become more widespread. The government's policy of capping benefits does not help, since nobody is doing anything about rent capping. In Hoxton, once far from being a fashionable area, the New Era estate tenants were faced with a 'developer' threatening to double rents and evict those who could not afford them. The long neglected Battersea power station site is finally being developed for housing, but not at prices most Londoners can afford. On a smaller scale, flats being built as part of the Willesden Green library redevelopment are being advertised in Singapore, apparently. Whether anyone in sunny Singapore really fancies moving to Willesden we don't know, but as with Battersea, they are being sold the flats as an investment. Well, we've all played Monopoly. But whereas that's just a game, the pundits and politicians on television talk as though the supply and demand for land, and the price of homes, is some kind of objective process, the values are real, and we have to move out to the Green belt, or treat old and run-down estates as "brown belt" for redevelopment -and more expensive- housing. Oh, and at least two thirds of the council homes which were supposedly sold to tenants are now in the hands of private landlords renting for profit. And now another aspect of all this has come into view. Some 36,342 properties in London have been bought through hidden companies in offshore havens and while a majority of those will have been kept secret for legitimate privacy purposes, vast numbers are thought to have been bought anonymously to hide stolen money. Some sources claim it has skewed developers towards building high-priced flats and houses rather than ones ordinary people can afford. While corruption and tax evasion are likely to be the biggest sources of the illicit money, drug dealing, people trafficking and sanctions busting are also common, police say. TI’s research, which includes previously unreleased internal figures from the Metropolitan Police Proceeds of Corruption Unit, found that 75 per cent of properties owned by people under criminal investigation for corruption are held through secret offshore companies. London has become a global magnet for corrupt funds, TI said, due to the high prices of property – enabling millions of pounds to be laundered at a time – and Britain’s notoriously lax rules on the disclosure of property ownership. Anti-corruption activists including Boris Nemtsov, the Russian opposition figure murdered in Moscow last Friday, have repeatedly expressed frustration that the UK does so little to stem the flow of money stolen from their countries. Over £180m of UK property has been investigated by police in the past decade, but this is likely to be only a small proportion of the actual amount, the report says. UN figures suggest only 1 per cent of money laundering flows are detected. More than a third of company-owned London houses are held by effectively anonymous firms in the British Virgin Islands. Jersey companies own 14 per cent and the Isle of Man and Guernsey 8.5 per cent and 8 per cent. What was it Mrs.Thatcher said about not letting criminals profit from their crimes? Perhaps if David Cameron wants a monument to the 'Iron Lady' it could be a Statue of Dirty Liberty inscribed "Bring Me Your Crooks and Corrupt Dictators, and especially the Money".